Dawn O’Porter joins forces with Oxfam to promote second hand shopping – and you can get involved too! The series has just finished (boo!) 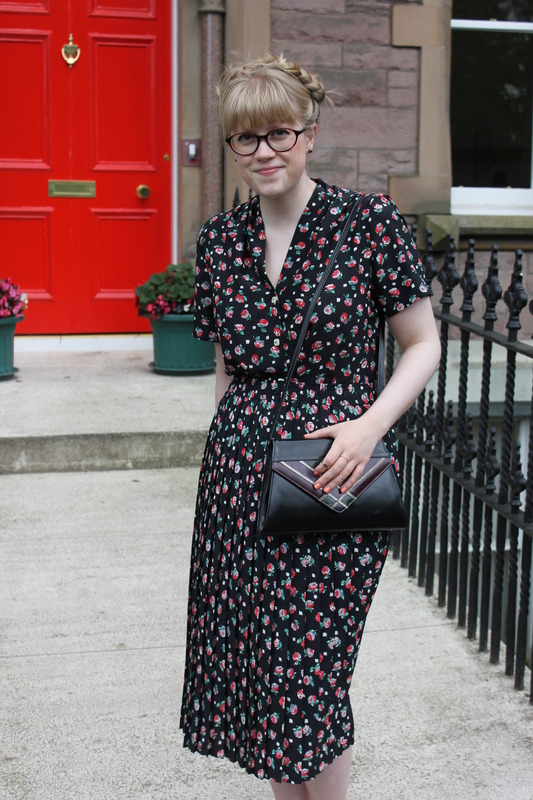 but Dawn has teamed up with Oxfam to promote vintage fashion with a series of #ThisOldThing events all in the name of charity, kicking off today with Vintage Friday! Simply don your favourite vintage finds with pride today, 1st August, and text Vintage to 70066 to donate £3 to Oxfam and fight poverty around the world – details on the Oxfam blog here. 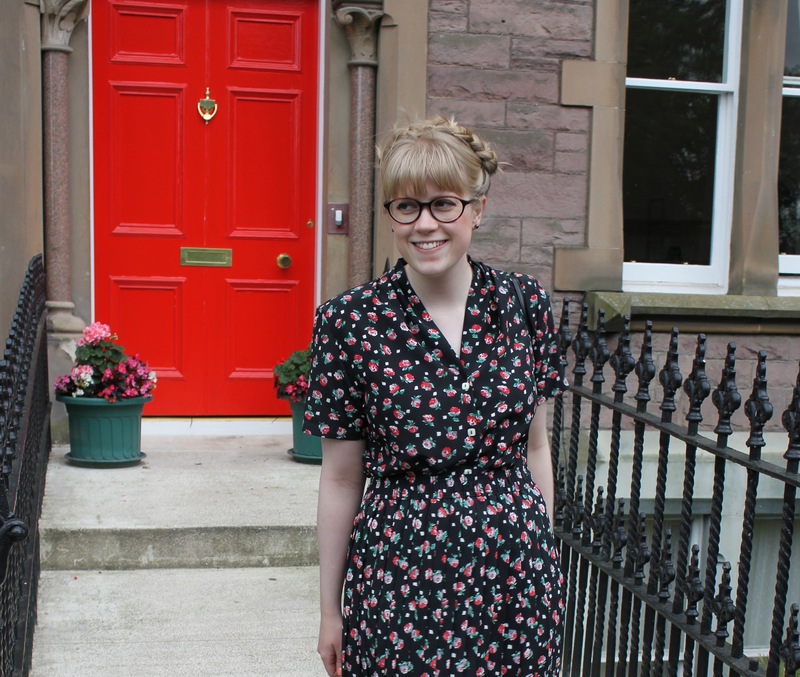 Whether you’re at work or play, in the office, uni, or getting a group of vintage-loving friends together, I think it’s a lovely way to raise money doing something you love. I can’t wait to see the other events in the pipeline too! 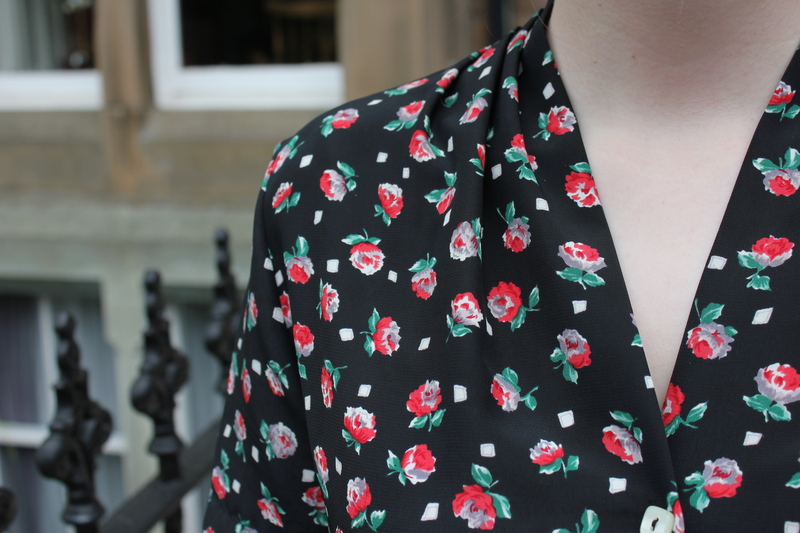 To celebrate and donate, I’m wearing my latest vintage find today – a rose print two-piece I picked up at the Vintage Festival during a flying visit to Glasgow last weekend. 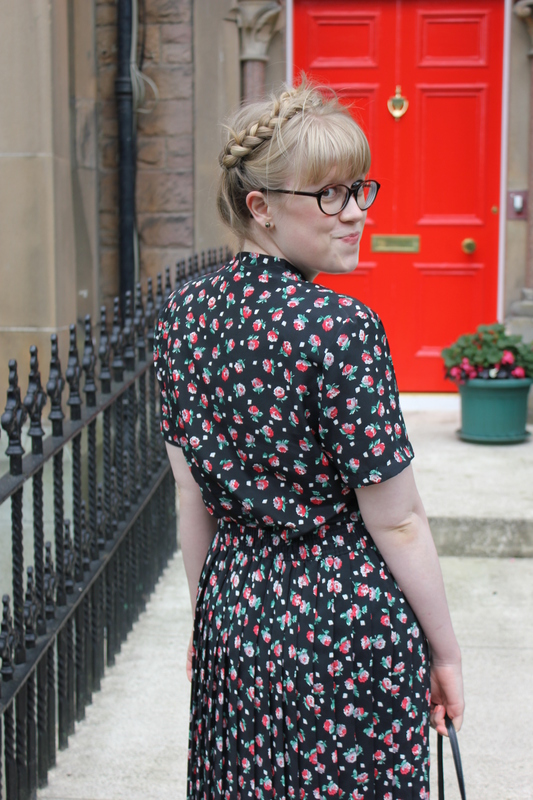 It’s an ’80s does ’40s M&S number – I adore the print, the gathered neckline and pleated skirt. 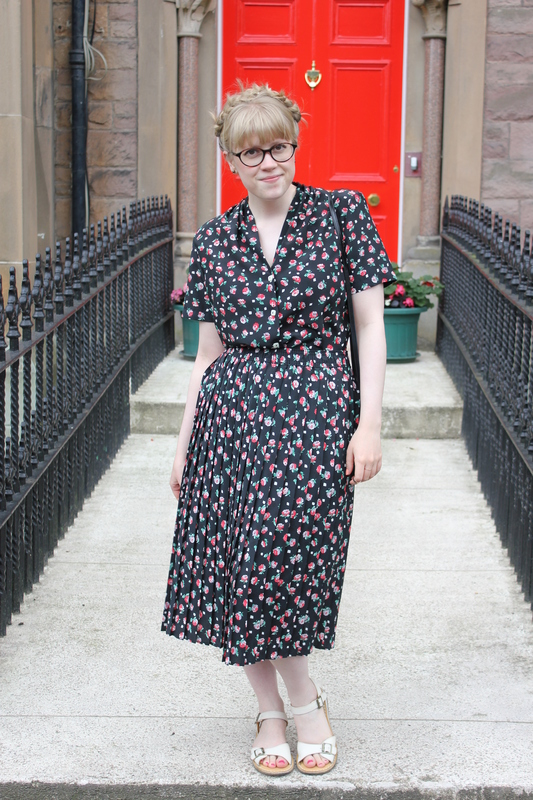 It looks a bit like a tea dress worn together but I can’t wait to style up both pieces separately too – three outfits in one. 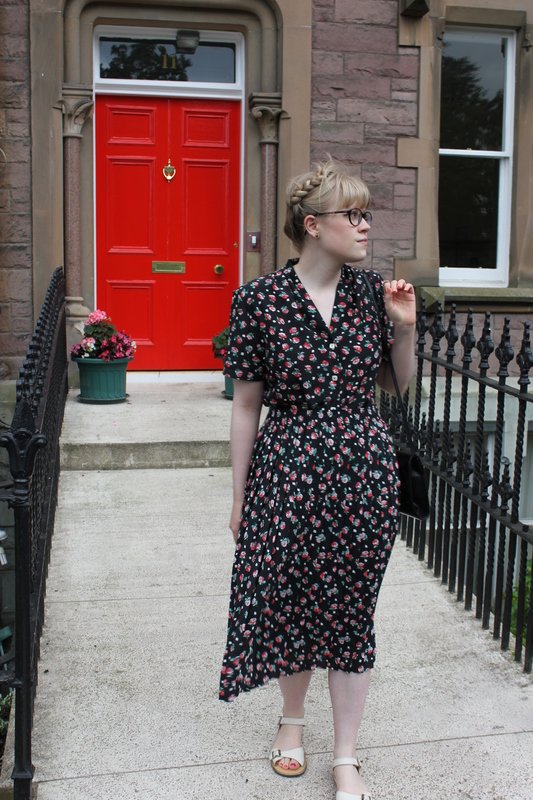 (So much for the ‘co-ord’ trend, vintage does it better!) The vintage marketplace was amazing – I came away with the most beautiful faux fur jacket and an array of mismatched crockery, but could have happily taken half the stalls home with me. 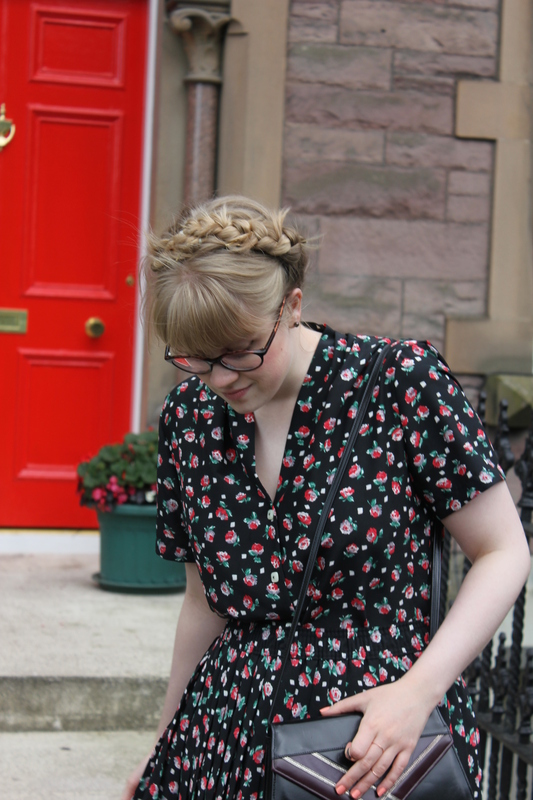 I’ve paired my two-piece with my vintage Van Dal bag (a charity shop bargain), Heidi plaits and retro-style Clarks Originals (we took these pictures just before a huge downpour – nothing says Scottish summer like soggy sandals!). You can share your pics with Oxfam by tweeting @Oxfamfashion, @OxfamOnlineShop and @ThisOldThingtv using the hashtag #oxfamvintage. I can’t wait to see what everyone else is wearing. 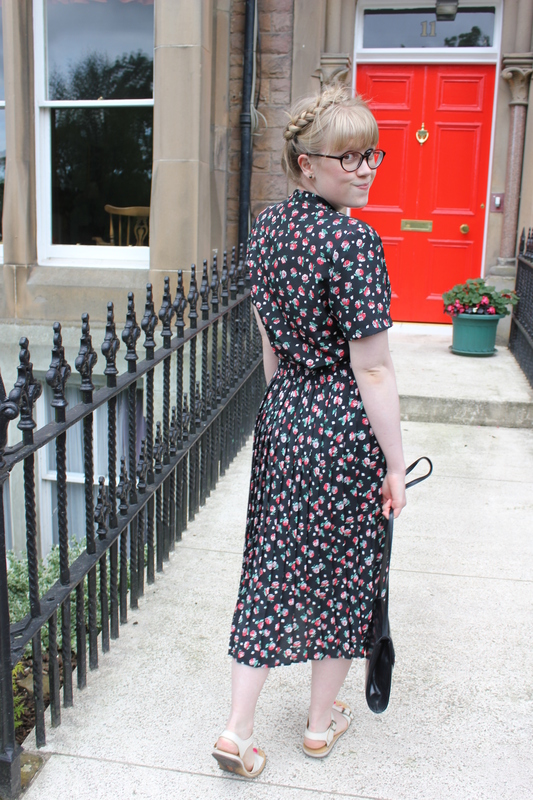 If only every Friday was Vintage Friday! Have you been watching This Old Thing? 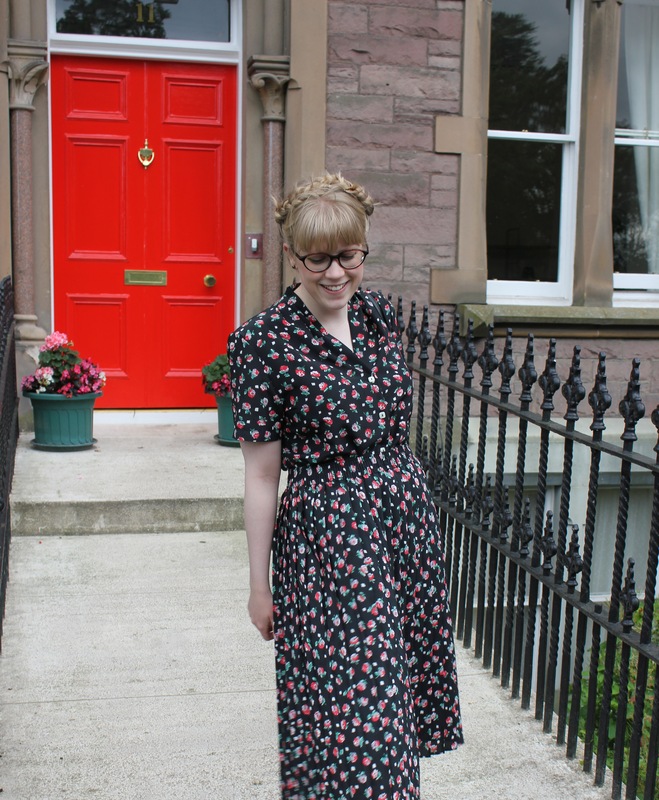 Will you be taking part in Vintage Friday? Love this post! 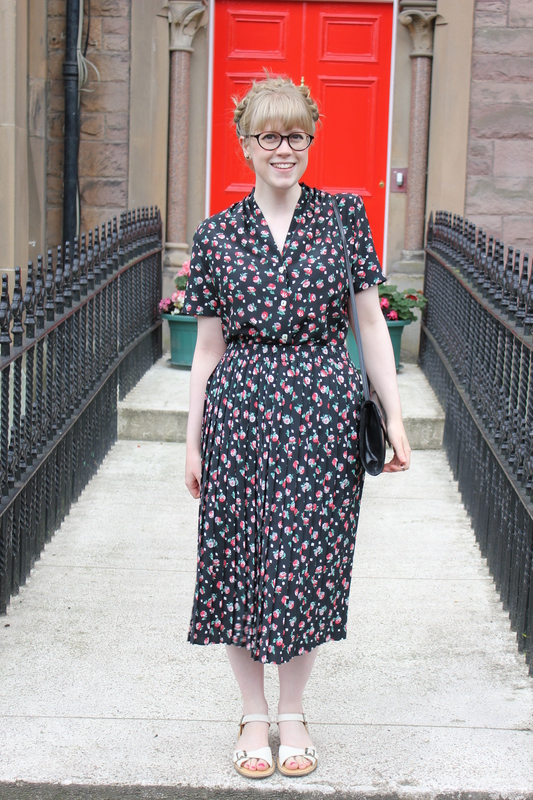 I did a vintage store post on my blog a while back and Oxfam definitely had the best stuff. Its amazing what you can find (and I live in St. Andrews). LOVE this outfit on you. Perfect. 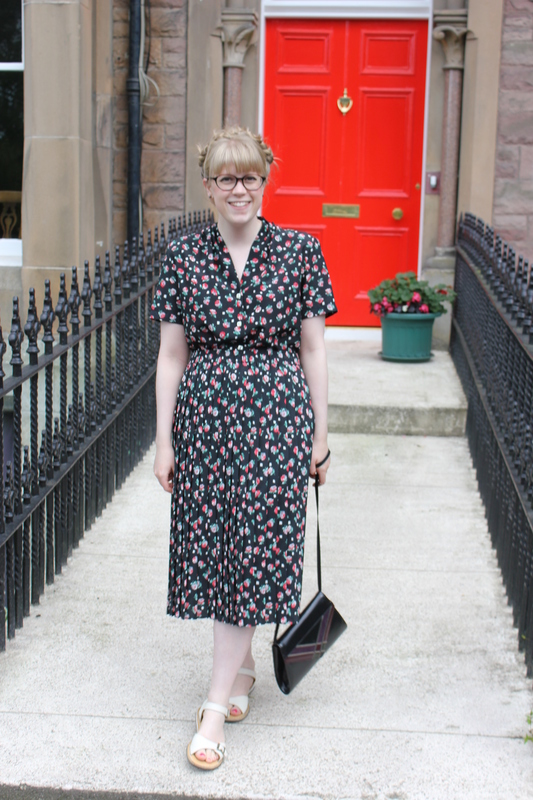 I’m such a vintage clothing faN. 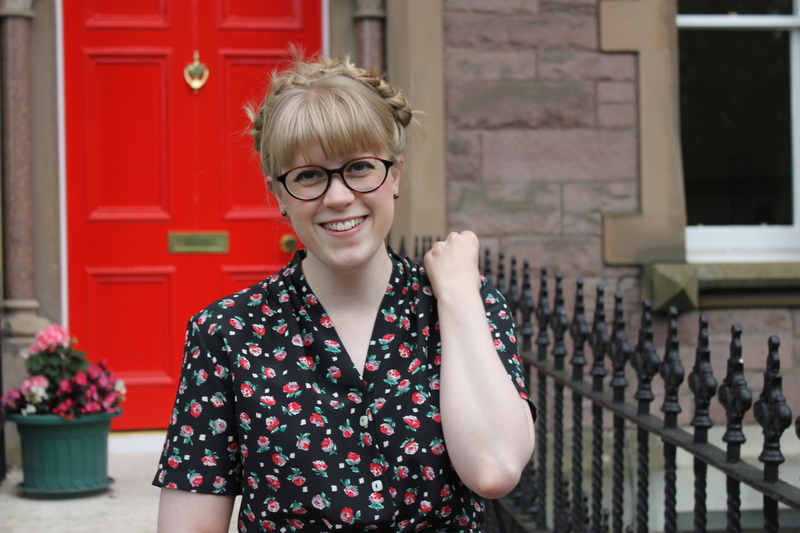 I am so happy to have found your blog! 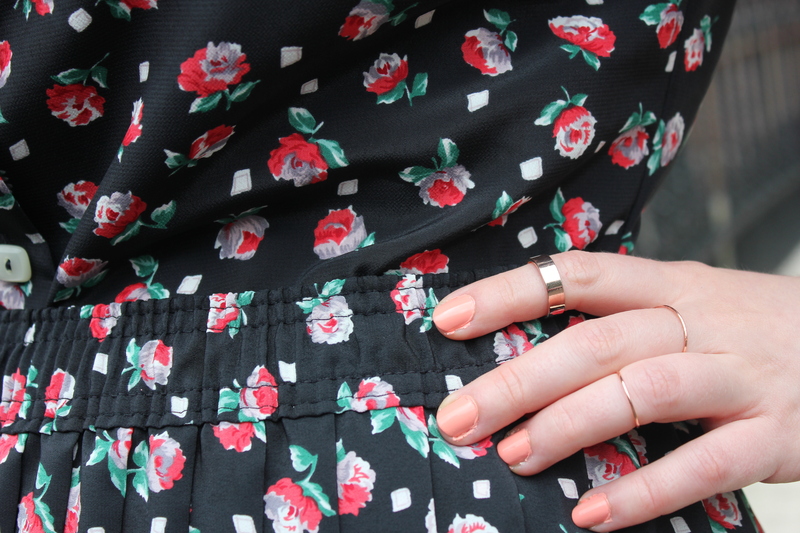 I adore that dress on you; you make the dress your own. 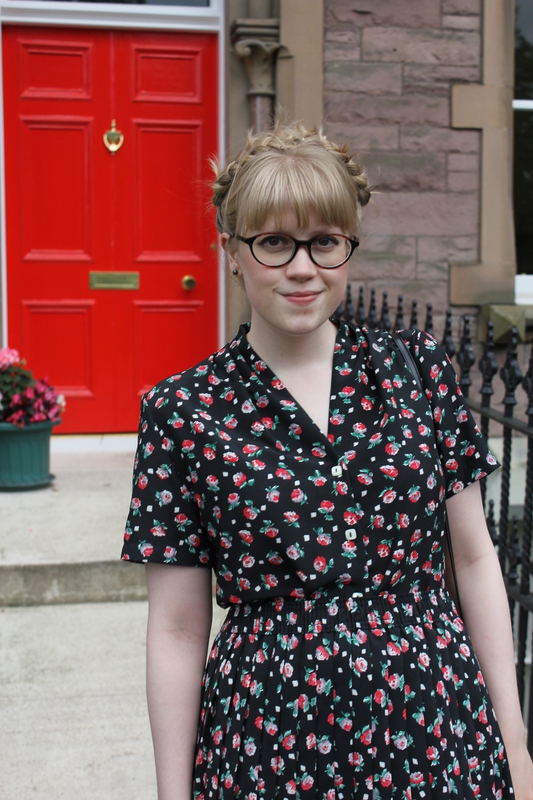 I will be traveling to Edinburgh for the first time in December and was looking for some idea of what is practical/fashionable. I look forward to reading more of your posts and your recipes for all the gorgeous treats you’ve made.